In the month of August 2013, India added a total of 1.84 million new mobile subscribers, taking the total tally to 876.72 million as per the latest TRAI report. 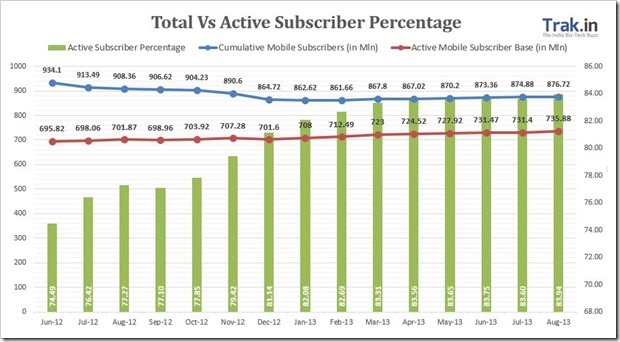 This is the 4th consecutive month that mobile subscribers have show positive growth. Though we are a far cry from what India witnessed in 2010 and 2011, when average subscriber additions every month were over 10 million. Infact, many including myself thought that India would reach the magical figure of 1 bln by the end of 2012. But, in reality those numbers were only inflated numbers, as many inactive numbers were also getting counted. Since, TRAI came up with the ruling that inactive numbers will not be counted, suddenly those numbers went out of the system and now the numbers reported are nearer to reality. Interestingly, active subscriber base grew quite sharply – Aug 2013 witnessed 4.48 million more active subscribers than previous month ( 735.88 mln in Aug as compared to 731.4 mln in July). The percentage of active subscriber base has now risen to 83.94 percent. This is nearly 10 percent higher than 74.49 percent in June 2012. – With an increase of 1.84 million in Aug 2013, total mobile subscriber base has increased to 876.72 million. 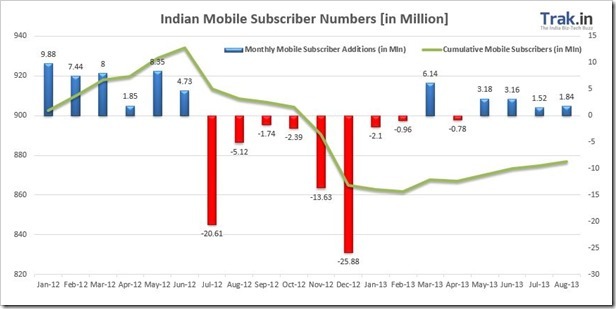 India had 874.55 million subscribers by end of July 2013. – Urban India witnessed an increase of 0.01 percent or 0.05 mln subscribers, while rural mobile subscriber base increased by 0.51 percent or 1.79 mln. – Urban Teledensity decreased to 139.65 from 139.87 in July, while the rural tele-density increased to 41.05 from previous 40.88. – Urban mobile subscriber share stands at 59.98% as compared 40.02% of rural subscribers. – 2.37 million new Mobile portability requests were made in month of Aug 2013, taking the total tally of MNP requests since launch to 100.20 mln. – Active Mobile Subscriber base increased from 731.40 mln in July 2013 to 735.88 mln in Aug 2013 taking the active percentage to 83.94 percent. – Broadband Subscription increased to 15.28 mln from previous tally of 15.24 mln. – Wireline Subscriber base fell to 29.46 mln in Aug 2013 as compared to previously 29.58 million. – India’s total telecom subscriber base (wireless+wireline) has increased to 906.18 mln in Aug 2013, compared to 904.46 mln in July 2013. Aircel has been on top for second month consecutively. In month of July they added 756k subscribers, and in month of Aug they were again on top with 876k new subscriber additions. On the other hand, Vodafone lost subscribers for 2nd month straight, however, it was not as steep as in July. 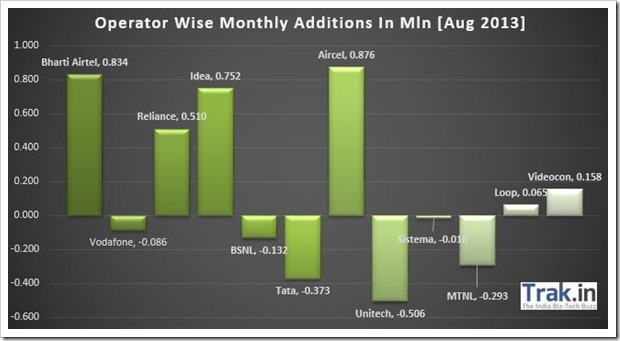 Unitech was the biggest looser in month of Aug, losing over half a million subscribers followed by Tata, who have been perpetually losing their subscribers over last year and half. Bharti Airtel remains Indian telecom market leader with 21.93 percent market share, followed by Vodafone (17.60%), Reliance (14.46%) and Idea (14.37%). Google Is Turning Evil; Advertisements Push Actual Search Results Below Fold!